The FCC on Thursday released the full text of its historic 400-page net neutrality order, which reclassifies broadband service as a public utility and subjects providers to some of the same common-carrier rules that telephone companies must follow. The FCC voted 3-2 to approve the rules on Feb. 26, but the full details weren't made available until Thursday. The new document specifies that the FCC is flatly prohibiting carriers from blocking or throttling lawful content, and from charging companies higher fees for prioritized delivery. “There will be basic ground rules and a referee on the field to enforce them. 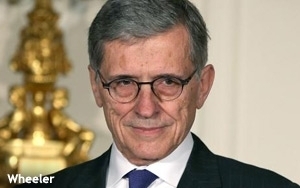 If an action hurts consumers, competition, or innovation, the FCC will have the authority to throw the flag,” FCC Chairman Tom Wheeler said Thursday in a statement. In addition to the bright-line bans, the regulations contain a more ambiguous “general conduct” provision that broadly prohibits carriers from unreasonably impeding consumers and content providers from reaching each other. The FCC said on Thursday it will take a “case-by-case approach” to evaluating whether particular practices violate that general conduct standard. One practice that could be subject to that individualized analysis is the imposition of data caps, which can limit the amount of material consumers can stream in a month. Some advocates say providers could use data caps to disadvantage online-only video competitors, like Amazon or Netflix. But data-cap proponents say that they can benefit consumers by giving them more pricing options. “Given the unresolved debate concerning the benefits and drawbacks of data allowances and usage-based pricing plans, we decline to make blanket findings about these practices and will address concerns under the no-unreasonable interference/disadvantage on a case-by case basis,” the FCC states in the regulations. The agency took the same stance regarding zero-ratings arrangements (also called “sponsored data” plans), which involve broadband providers forging deals with companies to exclude their material from consumers' data caps. “We are mindful of the concerns raised in the record that sponsored data plans have the potential to distort competition... At the same time, new service offerings, depending on how they are structured, could benefit consumers and competition,” the FCC says in the rules.